DESCRIPTION: Cedar wood phase 3 is situated in orofun village in eleko town before the free trade zone; it’s a property facing the road. 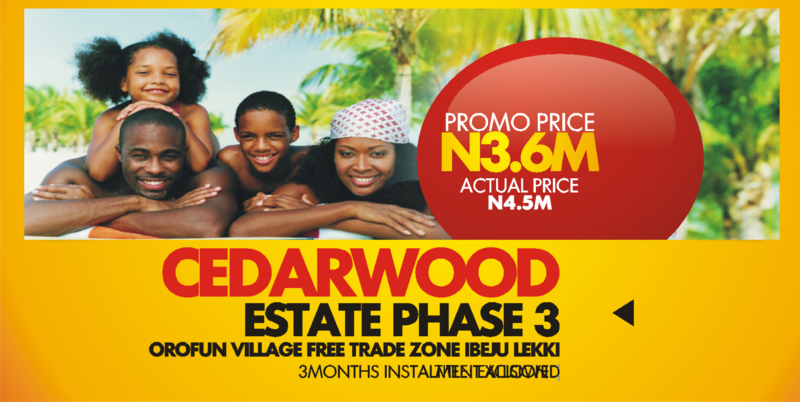 Cedar wood phase 3 is just 25 minutes drive after ajah. The neighborhood is surrounded by built houses. We’ve also engaged our engineers to start clearing as well as other projects. LOCATION: Cedar wood phase 3 is located in orofun eleko town before the lekki free trade zone ibeju lekki. PROXIMITY: Cedar wood phase 3 is few minutes’ drive to the free trade zone, dangote refinery, akodo general hospital, amen estate, etc. TOPOGRAPHY: The topography is Good, not swampy. DOCUMENT TITLE: Cedar wood phase 3 is completely free from all government acquisition; it has a registered survey, deed of assignment, layout, and government excision. COORDINATES: 601401.001.m E, 712284.003m N.
PROMOTIONAL PRICE: Cedar wood phase 3 is currently selling for 3,600,000:00 on outright. 12MONTHS INSTALLMENT is 4,000,000:00, initial down payment of 200,000:00. Spread the balance 3,800,000:00 through 12 months that is 316,667:00. ALLOCATION DETAILS: you get an instant allocation after completing payment.